Jam and preserve maker Becca Robins finds time in between canning jam for Bailey's Market, baking cookies for the Christmas Tree Parade and dating a police officer to nose around into the murder of a Christmas Tree Farm vendor. Becca's only clues to the killer are mysterious ornaments that begin to show up in her stall. 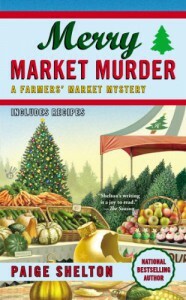 This 5th book of the Farmers' Market cozy mystery series will make you pine for a Christmas tree even if it's not Christmas yet.